​​​​ ​AUSTIN - Real estate values may be rising, but they are still small potatoes compared to major cities on the east and west coasts of the U.S.
Travis County, which according to the map is the most expensive place for residential real estate in Texas, comes in at $166 per square foot. This is brought into sharp detail in a new map from Metrocosm, a website from Max Galka that highlights novel ways to visually present complex data. 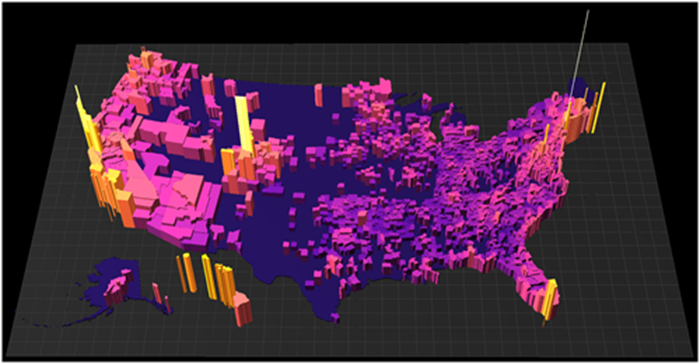 By clicking and dragging within the map, one can rotate it across three dimensions to reveal that each county is also given a height value to correspond with each respective county's average per-square-foot housing prices. ​See Austin Housing Market Research​ if you want data.